Kia has developed itself commendably in the midsize sedan segment. 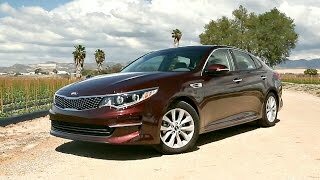 If we compare the third generation model launched in 2011 and the recently unwrapped Kia Optima 2016, we can notice the differences easily. This model owns a sportier design and deliver better power while maintaining the fuel economy. 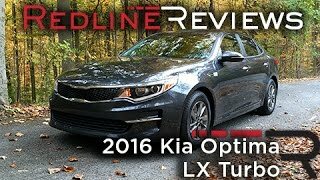 Let us have a look at the entire specifications and performance figures of Kia Optima 2016 through its review. The interior of Kia Optima 2016 is more spacious and comfortable in comparison to its predecessors. Spreading the luxury around are the dashboard and doors featuring contrast stitching and metallic accents. Talking about comfort the model has heated and ventilated seating with power adjusting feature for both driver and the passenger. Infact the passenger seat in front is height adjustable and come wrapped in Nappa leather or leather. The interior has been crafted in a way that the outer noise won’t disturb you much and will let you enjoy the clear and loud sound of the 630-watt 14 speaker sound system. There is an eight-inch color touchscreen mounted over the dash featuring both Android Lollipop and iOS 8 operating systems. 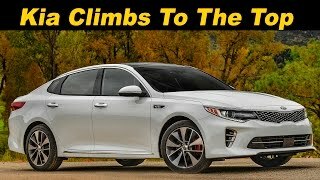 Thus concluding the interior details of Kia Optima 2016, all I can say is its best in class and crafted to deliver luxury, comfort and entertainment. Just like the interior, exterior of Kia Optima 2016 receives rounds of upgrades. Starting with the front fascia there is a redesigned tiger nose’ grille amidst the newly designed headlights while the lower portion gets vertical surrounds around the fog lamps giving the overall aggression to the model’s front appearance. Moving towards the rear end you’ll be noticing new set of taillights that are equipped with LED technology while the trunk lid portrays the sportiveness with its crispy lines. Beneath this entire setup is a retouched diffuser-like housed with two massive exhaust pipes. 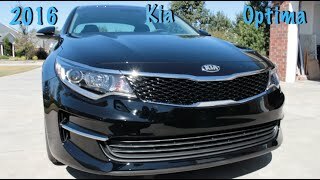 With these details rounding up the exterior look of Kia Optima 2016 I would just say, it is remarkable and impeccable. Beneath the hood of Kia Optima 2016 are three powertrain options; 2.4 liter four-cylinder, 1.6 liter Turbo four-cylinder and 2.0 liter Turbo four-cylinder engine. The engines produce total output of 185 hp, 178 hp and 247 hp and peak torque of 241 nm, 265 nm and 353 nm respectively. The performance figures of these variants aren’t revealed yet, but we assure you to share them as soon as company takes the curtains off them.